Country style homes are something to admire. Its designs vary from modern country homes to barn house conversions with character. Such homes allow for a lot of creativity to flow with the property owners aspirations. Many such home designs are simply incredible to see. The following are some country style homes for sale with wonderful detailing! Character and consistency flows through this home. Located just inside Quebec Canada around Val-des-Bois and a short drive to Ottawa Ontario Canada, this country home is built in unity with its landscapes. Surrounding the home is evergreens and deciduous that often reflect on a crystal clear water front. On the outside, this home design blends well from its large exterior shapes and lines leading to its mixed modern and natural landscapes. What seems to be a simple home on the outside holds a secret to much more on the inside. On the inside, hand finished cedar is throughout. It’s lines and shapes transition from room to room creating a wonderful combination of tones. It’s detail is so well done, you can’t help by to explore each panel. The structural beams of both the ceiling and loft areas are left open. Although its shapes are contemporary, its rustic colors are flow together with the rustic cedar. Each room was planned to give one a feeling of grand, luxurious and adventurous. Two of the levels have high ceilings creating a warm open feeling. Almost all windows in the home have incredible views to include panoramic windows for picture like moments. This country home is filled with wonderful design. The space and choice of materials continually transition perfectly throughout and extend to the treed landscape and captive lake views. Log homes on its own tend to show off the details of shapes and grains of the wood. The colors of wood in its natural forms are pleasing to the eye. Moreover, one can take its beautiful looks a step further with interior design ideas and decor to enhance this luxurious log home design. In this case, wrought iron works wonderfully with this stair design. There is a harmony in color and depth to bring more interest to this exciting rustic design. It’s a perfect combination to highlight the features of a log home and give it a feel of both natural and grand. Interestingly, wrought iron has a long history of use for homes and other building structures dating back to ancient times when black smiths were in high demand to turn hard materials into tools and décor. Wrought iron comes from the past tense form of the verb to work, so put more correctly it means worked iron; naturally. More, the invention of the puddle furnace in the late 1700’s enabled more use of worked iron. Today, hand crafted worked iron is still an art and can be admired as within this country home. This Country Home is situated within a timber and mountainous landscape, thus it interior is an extension of its natural surroundings. See more views of this country style property. Located in Southern BC Canada, this Princeton BC property is a wonderful home to explore. From the outside, its dark colored green rooftop compliments the forest and its rustic log sides are enhanced by the multiple level decks and grand logs giving it a feel of being a luxury country home. On the inside, each log is beautifully cut with imperfections and detail that brings out its grains and knots. To compliment these broad logs, stair rails and window frame areas also use natural wood shapes, grains and colors. To mix up the look between rustic and modern, a beautiful light woody colored laminate floor is used. This completely changes the feel as your eyes move from a smooth clean look to the every changing lines of the logs. It is both interesting, natural, rustic, and warm. The kitchen has modern appeal as with its kitchen island, yet, it uses rounded corners at the entrance from the logs. This creates a balance between contemporary and rustic. A rockery chimney for show stands out with appeal. It compliments the black wood stove with its black vertical chimney that contrasts the light wood color behind. Too, a smart choice as an open wood stove would do a much better job of heating the home. 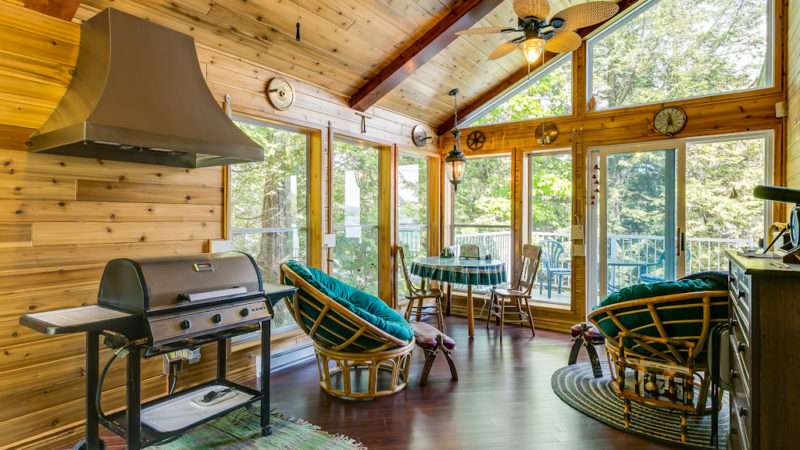 In the upper level, you can’t help but to enjoy the collection of log beams. As the beams travel vertical and horizontally, it connects with the railings and ceilings giving one an exciting log home feel. Both of these Country style homes are incredible architectural works to marvel. Its unique house designs seem to have no boundaries to exciting details in design other than the creative vision of its home designer. This entry was posted in House Design. Bookmark the permalink.